I bought this as Birthday gift for a friend and it arrived in perfect condition and very quickly (took less than 2 days to get here). I would recommend this shop to anyone wanting this type of unique item. Love this! I can't wait to make the next batch of cookies for my Pom & mini-Eskie. We found shopping from this supplier a positive experience and would recommend them. They delivered promptly, keep us informed and the product was exactly as they described. Absolutely LOVE! There was a problem with my order being lost in the mail, and right away they sent me out a new cookie cutter and I got it within 3 days!! Amazing customer service and FAST shipping!!!! Perfect gift for my gamer brother! This is ideal! Seller was prompt to respond! Seller processed and shipped quickly! Item was exactly what I wanted and the size was perfect! 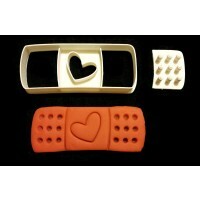 I used it immediately and to cut fondant and it worked just fine. Thank you! Will definitely buy again! © 2015 Things4Thinkers. All Rights Reserved.